Anyone up with bumper pull exp for a equalizer hitch? Dave I'm sure they're are others here with more experience with me (used them towing a 26' trailer cross country and back but not more than that). My understanding is you hook up the trailer to the TV, load the trailer and then apply the torsion bars to level the trailer and vehicle. You likely need to readjust the torsion bars when you're unloaded versus loaded as the weights will be completely different. What I mean is if it's set correctly when loaded it will be incorrect when unloaded so my guess is trailer will wander (less weight on it). If it's correct when empty and then you load it you'll likely see more sagging on the TV which means less weight on the front end, trailer pulling more etc. Does that make sense? I also found that I needed to make sure my brake controller was set correctly to be sure I got full stopping power versus wheel lock on the trailer. I'm sure others will chime in who know more than me. What problems were you seeing? The reality is that the equalizer bars move weight to the front axle. I ask length and tongue weight, as once you hit the 25-28 foot mark sway reduction is a good idea. As long as you've set the bars to take weight, they will be helping. Then based on tongue weight you may need to adjust. The truck bouncing tells me you may have had them a little tight. I know when I've went overboard it feels more bouncy. It takes almost a full summer of towing the dang thing to figure out the sweet spot. My .02 from the past. I agree with Sam. Sounds like too much weight transfer to the front of the truck. so if this is a bumper pull trailer and "not a 5th wheel setup" here is my thoughts on why this happened as well as how to correct it. on all trailers regardless of their size and how many axle's it has, the weight should be distributed 60/40 between the puller vehicles drive axle's and the trailer. now, that 60 number is what should be on the TRAILER and not the tow vehicles drive axle and should be as close to if not directly over the trailer axle's and not past them. the 40 number should be towards the tongue/tow vehicle drive axle's. so in other words use the trailer for what it was designed to do (PULL/CARRY WEIGHT). 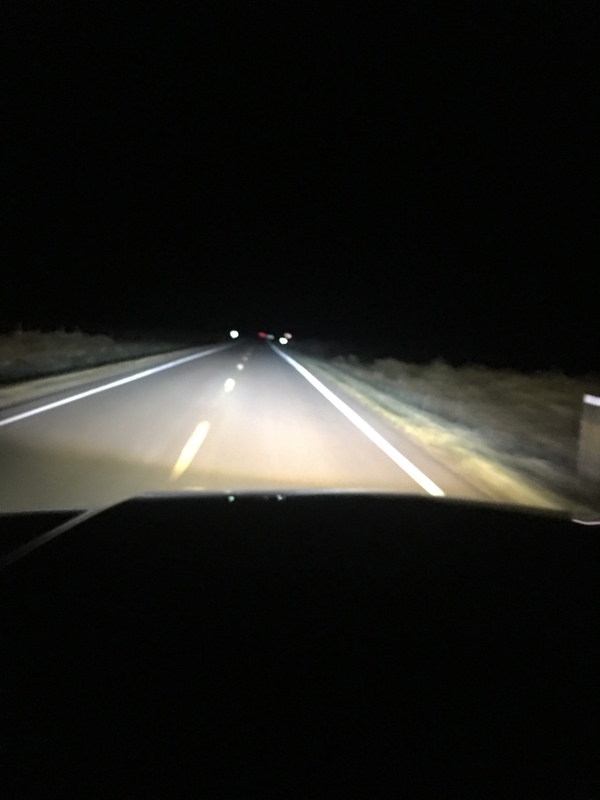 in saying that and from your description of symptoms, I would be willing to say that you had too much weight past the trailers axle's as well as pushing too much weight towards the tow vehicle steer axle (effectively leaving your drive axle unloaded). now here is how I have always been taught and teach people how to use weight distribution bars. - line your ball up with the hitch so that the hitch can lower directly on to the ball without any sort of wiggling to get it to couple. -raise the trailer coupler hitch so that there is about an inch (maybe less) gap between the flat top of the ball and the flat portion of the underside of the coupler hitch. now keep in mind that the amount of gap between the top of the ball and the flat underside of the coupler will vary based on the amount of weight that you are trying to distribute across the entire combination vehicle. add a leaf's, airbags and other additional weight improvement equipment will also play a role in this as well. it will take you a few times pulling whatever it is that you are pulling to get things figured out. you may also want to experiment with different setups and roll across a DOT approved scale and see what kinds of weight you are putting on the different axles such as steer, drive and trailer. you can find scales like that at just about every major truck stop (flying J is a Utah company and I am sure that they are all over your area). it will cost you something like $10 to get your first weight (starting weight) and I think its like $1 or something like that every weigh after that as long as it is in a 24 hour period. by the way, is this the first thing that you pulled with your new lift kit installed? 60/40? Maybe I am not understanding properly what you are trying to convey but that seems like an awful lot of weight on the tongue? Most couplers tongue load ratings are 10-15% of the gross trailer weight rating. I've set up an equalizer before. The manual was actually very good at explaining how to get it dialed in IIRC. You take measurements from the ground to the fender well, front and back as you're adjusting. So is this a camper/toy hauler, or an enclosed car hauler/toy hauler? If it's a car hauler, you definitely don't need bars empty. Dave, not sure what you are asking, if the trailer is bouncing because no extra weight is on the trailer axles/springs you will feel it in the drivers seat. Usually with weight distribution spring bars, too light of bar for the tongue weight will cause the front to back rocking feeling because the spring bars are flexing so much. That should not have been the case with an empty equipment trailer unless it is a very heavy sucker with a whole bunch of tongue weight and very low spring bar rating. I have only used weight distribution hitches that put the unloaded weight from the front axle of the truck back on the front truck axle. Most rigs only want to see the after hitched weight the same or a bit less than the unhitched weight. Yes the hitch will put some weight on the trailer axles also but the rear truck axle will still carry most of the tongue weight. Also, I always hook the trailer to the hitch ball before hooking up the spring bars. By doing so, you can raise the tongue with the tongue jack making it a lot easier to hook the spring bars. Now if you and Nate are talking about something else, I can't help you. Didn't see you were towing a Toy Hauler RV. Those things are very heavy on the tongue, some more when empty than with toys in the garage. More weight in the trailers rear half causes the tongue to be lighter. I am betting your spring bars were either not set tight enough or were to low rated for the tongue weight. You might even be over the hitch rating on the truck which could cause other problems. This is my understanding too and I have been looking into a setup. Do you mean 60/40 split over the trailer axle? I have been leaning towards the Anderson chain setup since a couple friends have them and love them. My TH grosses out at 11k and I was getting a little wobble last time. folks, I split this from its original 911 thread and gave it its own name. Dave, that set up looks low in front of trailer and nose high on the truck. What is the tongue weight of the trailer? Did you measure the front of truck height before and after you hooked up the trailer? If the truck has the factory round tube hitch, I am betting the tongue weight is higher than the hitch rating. Even if you have the proper spring bars, the hitch will flex causing the proposing you feel. I am betting the hitch weight of the trailer is North of 1,200 lbs so best case you will need 1,400lb bars and most likely an after market hitch that is rated at least 1,400lbs. Been there, fought the darn set up before heading to the scales and getting real numbers to work with. You guys are going about this advice giving all wrong. I have the solution Dave. Why does chevy only offer a dually with a long bed? No 6.5' beds on the general...?? Dodge, well, Ram offers three boxes. I actually think the Ram mega cab, short-short box looks good. Would be perfect for towing a fifth wheel and driving about when you get there. I had the same truck, and a 28' toyhauler. Without anything in the trailer, bikes. water, fuel, supplies your tongue weight is extreme. Once you are fully loaded is when I found my sweet spot for my hitch. after towing it once without bags I immediately put a set of airlift bags on it and wireless compressor to reduce the bounce you are experiencing. my truck was an 05 with 6" lift and 35s. Although depending on how I loaded the back end was how well it behaved on the road. I ride quads now and have them placed smallest to biggest front to back. and any extra gear I will unload at camp goes as far back in trailer as possible. reducing tongue weight. the biggest game changer for me is fresh water, I have 2 75 gallon tanks (1500 lbs) on mine which is insane but I can dry camp for a week without worry. when im full to the brim it plants my trailer and keeps all the axles/tires behaving on the hwy. it took me a summer of camping to find the right arrangement. its really an experiment to find your sweet spot. But I would say the bags are a must, with ANY toyhauler. 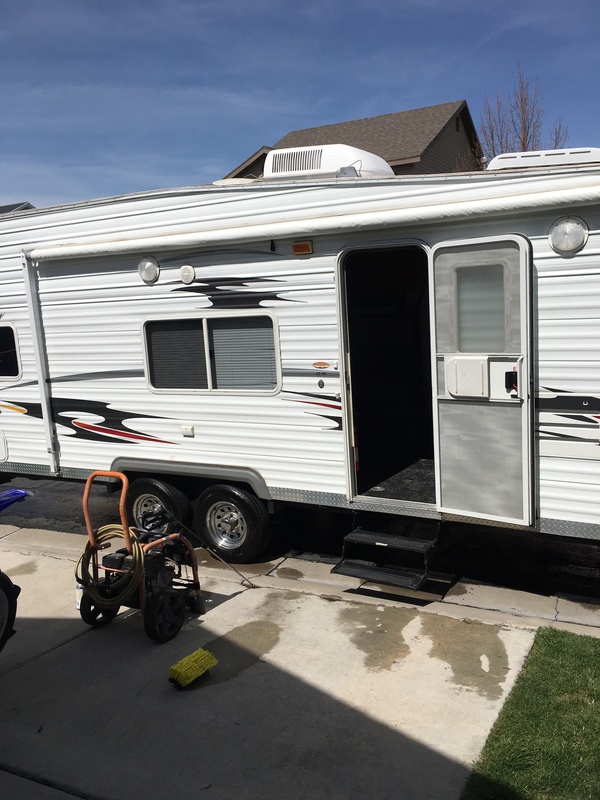 Toy haulers are by far the hardest of the pull trailers to get properly set up for towing. They are so tongue heavy to start with, and the weights are always shifting around as garage loads change. Just as important as proper hitch set up is being sure the thing stays within the tire ratings. 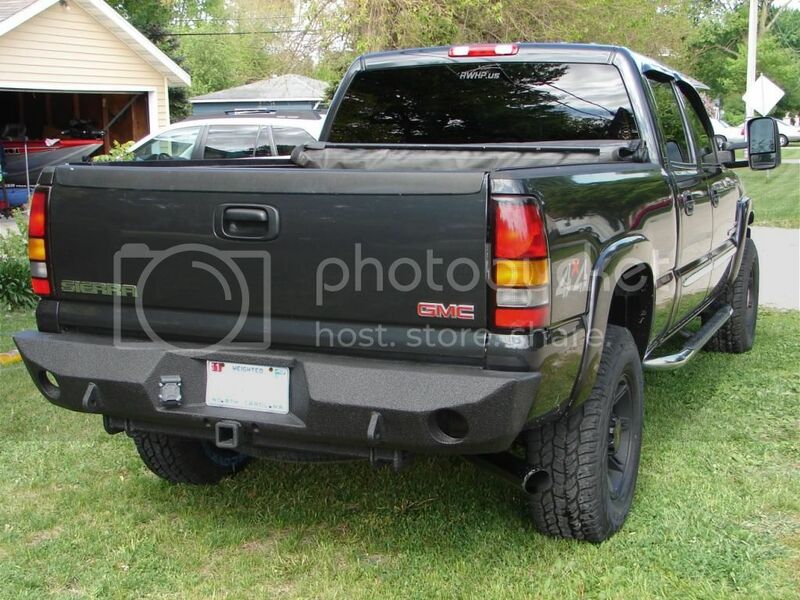 Then the tow rig, lifted isn't the best, oversize tires are not the best, air bags must be adjusted before setting the spring bars up or the bars are loosened up as air is added, and round tube GM 2 inch receivers are junk with low weight ratings too. 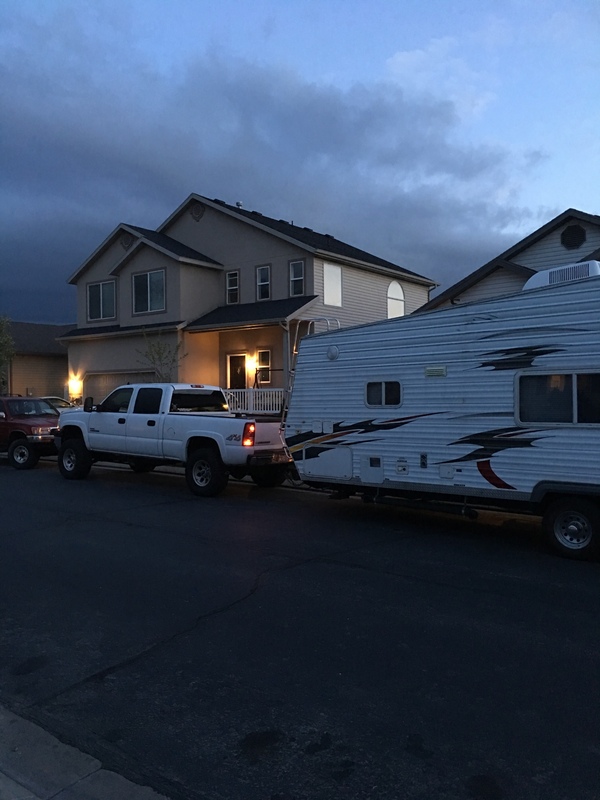 The good thing Dave, you don't own it and most likely won't be towing all that much...If you are going to be towing it, take the time and get it set up, you don't need problems while on vacation. I made it home from the camp trip, the weight label has faded long ago. I adjusted the hitch after watching some videos, and distributed my load a little different. I put most of all the load on the very back ( I only brought to dirt bikes home). It towed really well on the way home. The nittos hold the corners well and handle the load really good in my opinion, I do need to invest in air bags. I Will be getting a load appropriate hitch for my truck. I see your grab handle broke off too. Airbags were my first thought when I saw the truck and trailer pic over on DF. Curt always seems to get good reviews and you won't be sorry going with a class V.
My stock hitch is coming off (round bar GM) and its getting a Ruenell bumper with integral receiver. Copy that. Looks good to me! The Curt hitch is heavily praised on DF. I have no personal experience though. JR, If interested I can work you up a price for a bumper with integrated hitch. I doubt I could beat there price after taking shipping into consideration. I've made a few minor tweaks since this one was built but the same general shape applies. I'm sporting the curt xd. One beefy hitch in comparison to the stocker. Can't find the picture of the model, but it was 2" receiver class v.
I'll get numbers if you want. I think Kyle may have put the same on on his too. Whats the story on the bumper bear? $? Estimated towing weight? I don't have any official ratings for it. The draw bar is a 4' piece of 4" square tubing with 1/4" wall. I weld a 2" receiver tube in the center of it. Then I take a couple pieces of 6" x 3" rectangular tubing and cut 4" squares in each end. The drawbar slides through the cut outs and is welded to the tubing. Then I drill and notch the tubing to mount to the truck frame. Pricing varies. I would offer anybody here special pricing. I think it would be about $850 for a non painted bumper, plus shipping. I generally prefer to ship bumpers raw. It makes packaging and shipping cheaper and removes the possibility of the paint being damages during shipping. $850 isn't bad when you consider a $400 hitch plus another $650-$1300 for a bumper elsewhere.